“Last night I watched a man nearly kill a guitar, and a guitar nearly kill a man.” Sadly not the words of this scribe, as they are so eloquent and accurate, but the words of a good and close friend who was also in the audience to witness the compelling emotional candour of two of the UK’s foremost guitarists playing at Camden’s renowned venue, The Jazz Cafe, last week. In support, Matt Stevens, one of the progressive music scene’s finest proponents of six or more strings, both in his solo work and that of his band The Fierce And The Dead. A gentle, excitable giant, Stevens’ joy at playing this venue in support of Gomm (the two musicians have been friends for many years) radiates from the stage in demonstrative, impulsive waves. What Stevens can’t do with some well placed loops, distinct and singular soloing and some seriously off-kilter time signatures is nobody’s business to know. The first death of the night nearly comes when Stevens’ guitar throws not one, but two strings as a result of the incandescent fury of his playing. A spontaneous bout of audience participation ensues as we are all invited to keep the interrupted song’s beat through clapping, whilst in the background The World’s Fastest On-Stage String Change takes place. As soon as Stevens starts playing again, a third string snaps and a second guitar is quickly sourced to bring the set to it’s climax. It’s an heroic 20 minutes of live music, made all the more compelling for the added drama and the triumph wrought from potential disaster. 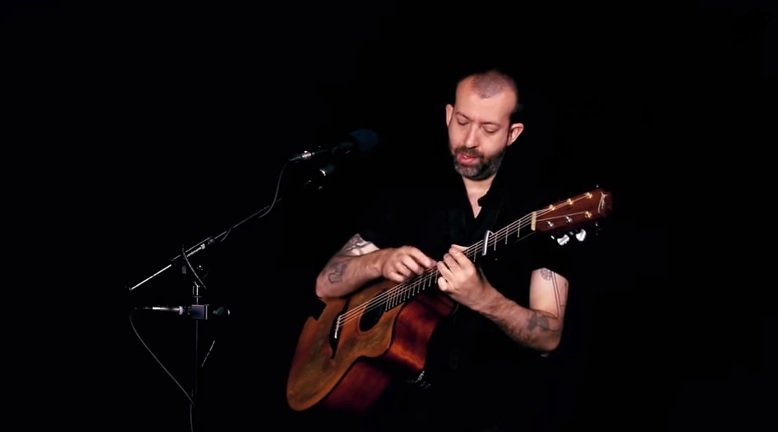 Jon Gomm is a very different prospect altogether. His physical presence on stage in Camden is one of outward calm, containing an intense inner-fire. When he speaks from his bare-footed frame to explain a playing technique, give context to a song or even chasten less attentive members of the audience, he does so in considered tones that make his points directly and with warm, dry, occasionally dark humour. It’s not long before pin-drop silence envelopes the room as all become lost in this most compelling of performers and performances. If you’re not familiar with Gomm’s style and technique, he is a musician and songwriter of unparalleled power and capacity, using his instrument to conjure a whole orchestra with the touch of just two hands. Percussion, rhythm, bass and lead are all present at any one time, leaving you wondering how the man doesn’t physically resemble an eight-armed Indian goddess. All of which would be extraordinary in itself, but Gomm’s compositions are lyrical, electrifying and heart-rending in and of themselves. Never mind the guitar-wrangling, the man also has another instrument of exquisite pulchritude in his singing voice, which he controls throughout the night to mesmeric effect. From the deeply personal to the broadly political, Gomm’s set list at The Jazz Cafe moves sublimely between the progressive 10-minute excursion of “Everything”, the Rastafarian-on-a-train inspired “What’s Left For You?”, perhaps Gomm’s most well known pieces in his cover of Chaka Khan’s “Ain’t Nobody” and the Stephen Fry endorsed “Passionflower”, and on through new song “Deep Sea Fishes” and the piece that specifically draws on his experiences of living with bi-polar disorder, “Telepathy.” The latter in particular draws attention to how deeply invested in his art Gomm is, requiring some deep breaths post-performance and a brief explanation in a choked voice that it is hard to play without returning to the crushing lows of his emotional state at the time of its writing. Touching, angry, passionate, poignant: at The Jazz Cafe Gomm proves to be the living embodiment of the musician making sense of the world through his instrument, his art and the tensions that lie therein. In doing so he helps his audience immeasurably along the way. Catch him as soon as you can.